Cattle are out on pasture now and fortunately most of the intermountain high plains area has received great moisture and often the comment is heard "I never seen pastures look this good." This is also often followed with "can you believe these cattle prices? How long will this last?" I have not seen this much profit at all segments of the industry – from cow-calf through the packer, in my career. I would also say we continue to see high costs of production, however certainly corn and hay prices have backed off from the previous two years. I would challenge those to sit down and do some planning on how to best invest the added income this year. This might be the time to make some of those "it would be nice but I do not have time to" additions. At a recent IRM meeting I attended, Jim Robb of Livestock Marketing Information Service of Denver said "maybe this is the year to replace the old squeeze chute with a hydraulic chute." This is just an example but other items that may increase efficiency, safety or convenience maybe should be considered when times are good. Back to mineral supplementation. Many have made or are making decisions on proper mineral supplementation. I am constantly amazed to see the tremendous differences in annual costs of mineral from one operation to another. Some report annual cost near $10 per cow per year while others are in the $60 range. Obviously costs are only one side of the issue as one must ask if the more costly mineral program produce high enough performance to pay for the additional cost. In some incidences, "mineral" costs include additives that aid in fly control, ionophores that may improve performance or antibiotics that may aid in control of pinkeye or perhaps foot rot. Admittedly, with the considerably higher calf and yearling prices it takes less pounds of improvement or pregnancy to pay for higher cost but economics still should be the driving force in decision making. When horn flies go uncontrolled, cow performance is decreased and controlled studies show that calf weaning weights can be reduced up to 25 pounds. The question then becomes, "Which is the most economical way to control horn flies?" On a side note, house and stable flies have tended to be a bigger problem the past several years and although some will argue the insect growth regulating chemicals (IGR) have some impact on the house and stable fly, the label indicates horn fly control. Rabon does have some beneficial effect on controlling house and stable fly development in the manure patties however this often is not the only place for larva development. The house and stable fly are very difficult to control. Permectnins and other insecticides have excellent knock down effects but have very little residual so the fly population returns very rapidly. Of the minerals considered, phosphorus is the major element considered in range cattle. Even though the calcium requirement is higher in most all summer grazing programs, the available calcium in the forages will be adequate. The two trace minerals of most concern are zinc and copper. Fortunately most forages in the intermountain high plains area are relatively high in all minerals during the earlier growing period. The cows' requirement for phosphorus, on a percentage basis, is somewhere around .2 percent. Many analyses of good quality cool and warm season grasses up through July will be near or exceed .2 percent, thus meeting the cows' requirement. This is why several cow-calf producers provide only salt during the spring and early summer and appear to have good reproductive performance. 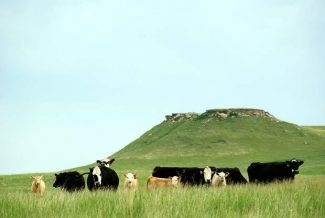 Studies in western Nebraska where steer gain was evaluated, phosphorus containing mineral supplements did not improve performance over steers only offered salt. As the grass starts to mature then often analysis will show the phosphorus will decrease below the cows' requirement as well as does zinc and copper. Therefore mineral supplements containing relatively low levels of phosphorus (4-6 percent) with some added zinc and copper may be beneficial in the later grazing season. The area of trace minerals is relative complex as there are areas where antagonists- primarily molybdenum and in some cases sulfur, nitrates and potassium can causes problems with cooper and zinc utilization. Also balances of trace minerals such as copper and zinc are important so before great changes are made "to solve your mineral problem" I would encourage a good conversation with a person well versed in beef cattle nutrition. It is important to monitor level of intake. In areas where the mineral levels in the water and/or forages are high, intake may be lower than desired. On the other hand, in some areas overconsumption may occur adding considerably to the cost. Most commercial mineral supplements will contain ingredients such as yeast culture or in some cases flavoring agents to enhance consumption. In cases where very unpalatable mineral sources, such as magnesium oxide, is used, these ingredients are needed however in other cases they are not needed for adequate consumption. If supplements are grossly over consumed then either blending with higher levels of salt to control intake would be advisable or perhaps only feeding the quantity desired for them to eat and not replenishing until the time for the next indicated amount for the consumption desired. As indicated earlier in some cases mineral programs may have other ancillary benefits especially horn fly control, so uniform and adequate consumption is necessary for good larvae control. These thoughts are presented to aid the producer in trying to keep mineral costs down and yet obtain good performance. High intake of high priced mineral will not do any harm to performance, however often times research conducted in the high plains area is lacking to show economical returns. I hope the rains continue and the grass stays green and plentiful all summer. Ivan G. Rush is Professor Emeritus for the University of Nebraska.